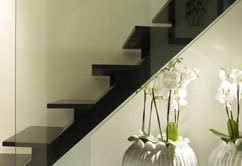 What I adore in Kelly Hoppen interiors is her identifiable style. 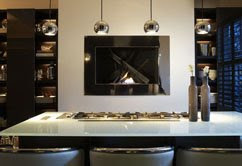 While others tend to create a mish-mash that can be best described as upmarket show home chic, Hoppen is known for a simple but opulent, East meets West style (see right) that appeals to the world’s super-rich globe trotters. And although lesser mortals are able to buy her interiors productsincluding ceramics, rugs, carpets, paint, as well as fabrics, hiring Hoppen for a personal makeover is more expensive – she reportedly only gets out of her silk-sheeted bed for £300,000 and counting. 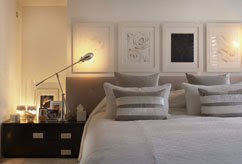 Her firm Kelly Hoppen Interiors does well too, earning up to £20 million a year in consultation fees and product sales.Top interior designer, queen of cream, celebrity style guru. Which one do you pick when referring to Britain’s most high-profile cushions and curtains expert, Kelly HoppenAlmost as famous for her love life as she is her design talents, the 50-year old’s celebrity connections include flings with celebrity hairdresser Nicky Clarke, TV presenter Jamie Theakston, footballer Sol Campbell and a marriage to Sienna Miller’s father Ed Miller.Hoppen lives in an achingly fashionable road near Portobello Road and has just finished a five-month refurbishment of her Georgian townhouse. The designer, who is normally very tight-lipped about her private life, recently let a photographer capture the sumptuous upgrade of her home, the results of which you can see here and much of which, as you might expect, includes products from her interiors business. I love this "white elegance" style . very inspirational!